If you are looking for inspiration to get healthier, you often don’t have to look very far. A few weeks ago, my son and I were walking in our neighbourhood on a Sunday morning when we met a gentleman in his mid-70s by the name of Bob Webster. 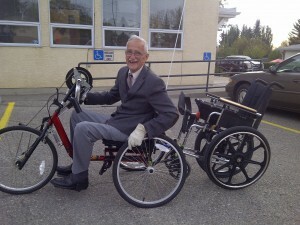 Dressed in a suit, tie and polished dress shoes, Bob was happily on his way to church by bike. What struck me and made me smile was that this wasn’t just any bike; it was an arm-powered bike that was also towing a wheelchair. I had to run to catch up to Bob who, evidently, could cruise at good speeds on his bike. We chatted a while and he smiled and said you need to do what you need to do. I learned that Bob had limited ability to walk and, despite suggestions by others who thought it was time for him to get a motorized wheelchair, he resisted. He liked that he had a mode of transportation that would allow him to keep up his fitness. I was inspired and grateful for the reminder that the key to good health is creative thinking. Regardless of who you are, you don’t need a revolutionary extreme lifestyle makeover. You need real solutions that fit your lifestyle and some creative thinking. There are many two-for-one strategies that improve your nutrition or fitness while also helping you with some other part of your life. Think about the unintentional ways you can build fitness. Need to pick up milk? Walk or bike with a backpack to the store with your family instead of driving. At work, suggest a walking meeting instead of sitting. Take a walk while your son or daughter is at a sport or music practice. Make some of your phone calls on your cell while walking in the park. Kids are naturally interested in food, cooking and baking. It might mean cooking takes a little bit longer but the benefit is that you have spent quality time with your kids, improved your family’s health and taught your children some valuable skills. Let them help make French toast or pancakes. Bake a double batch of healthy muffins for the freezer for fast breakfast or snack options. Make a hearty soup or stew where they stir and dump ingredients. When you suggest healthy social activities to your friends and family, you might be surprised at the positive response. Planning on meeting a friend for coffee? Grab the coffee and head out for a stroll. Meet family friends at the pool, zoo, park or other location that involves fun and fitness all at once. Plan a tapas party with friends and make the theme healthy appetizers. Have a soup-making party with a couple of friends over wine and good conversation. This involves each person coming prepared with one large pot, one healthy recipe and ingredients for a big batch soup that can be frozen in zipper bags for each person to take home. Cook three healthy family meals that can go into the freezer once per month with a friend. One of my favourite time-saving tips for meal planning during the week is to use what is called “planned extras.” Planned extras involve cooking double of something today to go into a new meal later. For example cook double the amount of rice or quinoa you need today and put this in the freezer for a fast addition to a meal later. Cook a double batch of meat, seafood or tofu stir-fry today (half teriyaki style and half spicy peanut Thai style) and serve the first stir-fry over rice or noodles and the leftovers the next night in a wrap. Grill zucchini, red peppers and portabella mushrooms and serve as a side dish tonight with grilled chicken and potatoes and use the leftovers for a quesadilla or pizza tomorrow. Cook a large amount of ground beef, bison or poultry and freeze pre-cooked in bags or containers to add into a tomato sauce, chili or tacos on a busy night.